Today we are showing some fabulous and intriguing quilts inspired by Native Americans' history and traditions. Native Americans are the "first peoples", or the indigenous tribes that already existed in North America when immigrants from other continents arrived. Patricia notes, " Lakota and Cheyenne Chiefs bravely led countering attacks on [U.S. Army General George Custer] and the 7th Cavalry. Centuries of Indian life patterns evaporated as ancestral land treaties were cancelled. Black Hills, South Dakota gold mining brought railroads through Lakota holy land." The June 1876 Battle of Greasy Grass is also known as the Battle of the Little Bighorn, where Native Americans fought and temporarily won against the attempts of the U.S. Army to resettle their tribes onto reservations. Patricia does a beautiful job of depicting these dignified and stately faces of the Lakota and Cheyenne tribes, who resided on the Great Plains, in what are now the states of South Dakota, Wyoming, and Nebraska. Patricia's techniques include inking, applique, thread-painting, and embellishments. The maps and lettering are in calligraphy, with free motion edging. The quilting pattern includes sacred symbols of the Lakota Sioux tribe. The quilt was exhibited at the 2014 Road to California. Patricia states, "Most-feared Apache (who lived in what is now Arizona), Cochise, a resourceful complex man, left his indelible footprint. Courage, integrity, discipline, intelligence, and generosity earned adoration by "the People", and respect by non-natives. With the Dragoon Mountains at sunrise, Cochise stands in readiness." Patricia's techniques include inked face, hands, and words' raw-edge applique, thread work, and free-motion work for outlining and quilting. We really admire Patricia's work in paying tribute to this heroic leader of the native people of the Southwest. On this impressive quilt are samples of some of the wise sayings of Cochise. To make this outstanding original design, Patricia used Tsukineko inks, embellishments, hand-dyed fabric, and fifty different shades of threads. The quilting patterns are horses, geckos, horned toads, agaves, and a star pattern. This quilt was exhibited at the 2013 Houston International Quilt Festival. This quilt was designed for the Basket themed New Quilts from an Old Favorite context in 2012, and exhibited at the 2014 AQS Quilt Week in Phoenix, Arizona. Karen's work in traditional southwest colors of blue and cinnamon red, is a tribute to the art of the Hopi tribe of northern Arizona and New Mexico, which produces beautifully made baskets with precise, geometric designs. Claudia explains, " It was about time : the whole lot ! Piecing, quilting, and embellishment. This quilt represents the Native American dream catcher (the circular designs with feathers hanging from them). [It contains] the rich colors of nature and the relaxing muted colors, much like the sands of the desert." Claudia's fascinating work won third place in the Innovative Quilts category at the Pacific International Quilt Festival and Best Embellished Surface ($1000 prize) at the 2014 Road to California. Claudia continues, "Not only do you see the pieced circle of the dream catcher with more pieced feathers and beads. But you also see the border with real feathers, beads, and jewels, all the elements you would find in a dream catcher. The intricate quilting gives texture, reminiscent of designs found on Navajo weavings on blankets and rugs. The couching defines the intricate working of the dream catcher." Here's a close-up of the fantastic long-arm quilting, as shown on the quilt back. Claudia's original design is hand and machine appliqued and machine pieced. Tomorrow is Memorial Day in the U.S., a day to honor those who died in service to their country. Each country has its own traditions of remembrance. In the Commonwealth countries, the poppy is used as an emblem of those who died in war, and Remembrance Day is celebrated in November. This striking quilt captured our attention in the 2014 World Quilt Competition at the Pacific International Quilt Festival. Soldier On is fiber artist Lucy Carroll's interpretation of the Roll of Honor at the Australian War Memorial. She says, "The placing of a poppy is a poignant act which connects us with fallen soldiers through the generations." Although the U.S. does not have the poppy tradition, this quilt speaks to us with its brilliant wall of poppies. At the end of the hall you can see two comrades supporting each other as they walk through the archway. This large wall piece is hand and machine pieced, and hand and machine appliqued. Lucy is a contemporary Australian textile artist and the winner of numerous national and international awards for her work. We hope these photos do justice to her stunning creation. For more of her work, see Lucy Carroll Textiles. Image credits: Photos were taken by Quilt Inspiration at the 2014 Pacific International Quilt Festival. Soldier On won Honorable Mention in the Innovative category. There are incredibly talented quilters everywhere... including Curaçao, an island in the southern Caribbean Sea. 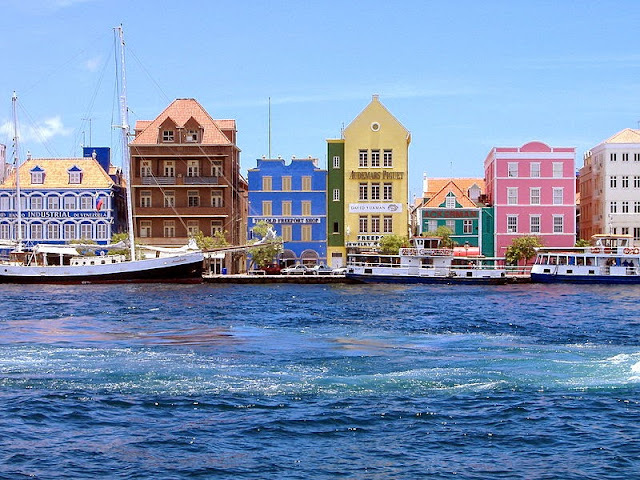 A constituent country of The Netherlands, Curaçao has a population of 150,000 and a vibrant art scene. Here are some fascinating quilts from Curaçao. Lucia explains, "[This is] my own interpretation of a painting by the Swiss artist Jean-Etienne Liotard. With the original headscarf on the painting, I went a bit "out of the box." What Lucia means is that instead of plain white cotton for this beautiful girl's scarf, Lucia used strands of gorgeous white crinkled organza fabric. We love Lucia's creativity in choosing the organza fabric, as it gives such a fashionable, stylish look to her work. Inspired by a painting, Lucia's work is hand and machine appliqued.The visage of this lovely young woman with exquisite, soulful eyes is embellished with a three dimensional pearl necklace and a gold circular earring. In addition, the neckline of her dress features long three dimensional black and white fringe which looks almost silver in the photos. Here's a close-up of the crinkly organza fabric for the headscarf. Don't you want to reach out and touch it to see how ruffly it is? We surely did; but we restrained ourselves and kept our perfect record intact of never touching a quilt in a show ! Nel writes, "As a paintress, I produced a lot of watercolors with topics of our island. Most of those are of houses and small streets. This is because our houses and streets are very colorful and show typical influences of the Dutch and Spanish cultures, which give them a very special character." We really admired the elegant lace, ric-rac, and cording Nel-An used for embellishment on this original design. It is hand embroidered and hand appliqued, with some use of a sewing machine. Lucia notes, "This quilt was inspired by the old kunuku houses of our island. I love to incorporate knitted or crocheted pieces in my work to create a three dimensional effect." Here you can see Lucia's excellent yarnwork in the form of the roof and the nearby cactus. The knitting and crochet provide a unique and innovative look to the traditional art quilt. Lucia's original design is hand appliqued with some use of paint. Lucia says, "When the Frangiani [Plumeria] is blooming, lots of huge caterpillars love it as much as I do. Then they gorge on the leaves." These dainty, delicate pastel pink organza flowers with their petite stems and petals lend such a contrast to the large dark, (and probably squishy !) caterpillar. Lucia's intriguing embellished quilt was inspired by a picture in 2013 and is hand appliqued, with knitting, crocheting, embroidering, and beading. Image credits: Photos were taken by Quilt Inspiration at the 2015 World Quilt Show in Florida. Another dimension in quilting: 3D Quilts ! Who says a quilt has to be two-dimensional? We love quilts with 3D shapes. With the advent of fusible webbing and spray products, many quilters are making bouquets, landscapes, birds, houses, and other fiber art creations, as you'll see here. And at the end of this post, you'll find some free tutorials for 3D flowers and leaves! In this wonderful quilt, all the elements were 3 dimensional: the shingles, flowers, and colorful bird. Suzanne says, "I enjoy the brightness of a planted window box, and was intrigued by Joan Shay’s method of adding a 3-dimensional quality to flowers and leaves. Not having found the right fabric for the shingles, I dyed one to the color I wanted – fun!" The colorful impatiens flowers make a pretty impression in this window box. This pattern and many other 3d patterns are available at Joan Shay's Petal Play. Helene Blanchet says, "I am a folk artist from Nova Scotia. When our children left home I wanted to make a commemorative piece of the place where we raised them in the small village of Oyster Pond – complete with all of our gardens, favorite activities and all the birds that used to come to our feeders (but you have to peek under the leaves to find them!)" The leaves have finished edges, and each leaf was quilted with veins, then appliqued to the background. This delightful spring quilt won a blue ribbon for 1st place in the Art/Innovative category at the 2014 Arizona Quilters Guild show. Georgia Thorne says, "In the winter, the empty flower pots inspired me to “Plant” them with color. I tried new products: Stiffy, Terial Magic, Glass Bead Gel, and Jacquard pearl paint." The Philip Jacobs purple fabric was perfect for the lattice work background, and the flower pots, leaves and flowers were so realistic they almost jumped right off the quilt. We spotted this cheerful origami-style sunflower at the 2015 World Quilt Show in Florida. The sunflower is both hand and machine appliqued with detail of stitching on petals and leaves. The on-point blocks are edge-stitched with green thread in a non-traditional form. The pattern is an original design by Jeannine Smetana. We were intrigued by Saturday Market Bags, which was exhibited at the 2014 AQS Quilt Week in Phoenix. Tina McCann says that piles of newly dyed wool fiber and silk, followed by a trip to the Saturday Market with piles of fruits and vegetables, inspired the quilt. Here is a closeup of the felted bag, with grape leaf decor. 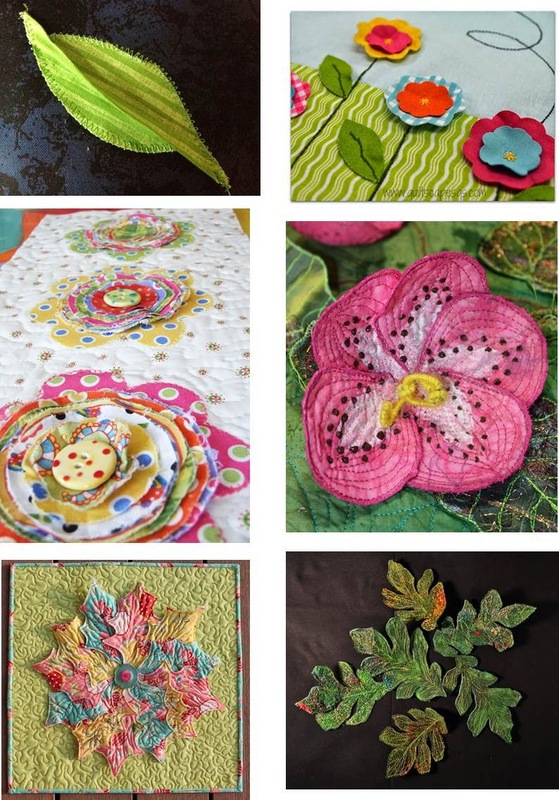 3D Fabric Tutorials: You can find a whole collection of books and videos on 3D quilt art by Diane Savona, Jane LaFazio and other authors at the Interweave Store. Or, checkout these fun and free tutorials we've collected from around the web ! Row 1: 3D leaf tutorial by Eva Paige Quilt Designs; Fabric 3-D applique shapes tutorial at QuiltScapes. Row 2: Shabby Chic pillow tutorial by Jennifer Heynen for Thermoweb; Flowers by Barb Forrister, tutorial at Quilting Daily. Row 3: Love is in the Air wall hanging project by Jackie White for Pellon Projects; 3D Foliage using Misty Fuse, tutorial by Barb Forrister. Happy Mother's Day to everyone who is a caretaker for her own family or who is a caretaker for another family. We hope you have time on Mother's Day to take a quiet break with a cup of refreshment as this mom below is doing ! In this delightful quilt, we see a mother taking a moment of repose with her children outdoors on a sunny day. Bodil writes, "As the mother of four children, I often find myself returning to the theme of this quilt." She continues from her biography, "I have been making patchwork pictures since the beginning of the 1980's. I started originally with ceramics, but....because it was more acceptable to sit at the living room table and sew -- nobody could see whether it was anything useful -- I began making patchwork." Bodil's work is raw-edge appliqued and machine quilted. We love the way that Bodil sews circular pieces of red or pink fabric onto the faces to give them those cute rosy cheeks ! Her characters are depicted with such whimsy and lightheartedness. From her biography, Bodil explains, " I have not had any artistic training and was brought up to be the practical one in a creative family.....Most of the pictures have a purpose and have been months in the making. I never draw them but plan them thoroughly in my head before cutting out and fastening with pins. Then follow days of weeks where I move colors and figures around before I begin to sew....Material is bought at flea markets or arrives as gifts. Faded, well-used cottons are fascinating and nice to work with. " Who couldn't help but smile at this delightful face with its happy grin, quirky nose, and wide-set blue eyes ! Bodil notes, " My hope is that by exhibiting, I can give other women courage to exploit their own creativity. Most of them have a sewing machine and some remnants of material -- no need to invest in expensive gear." On Mother's Day and always, we wish you the gift of some time each day to express your own artistic talents in the way that brings you fulfillment and happiness.